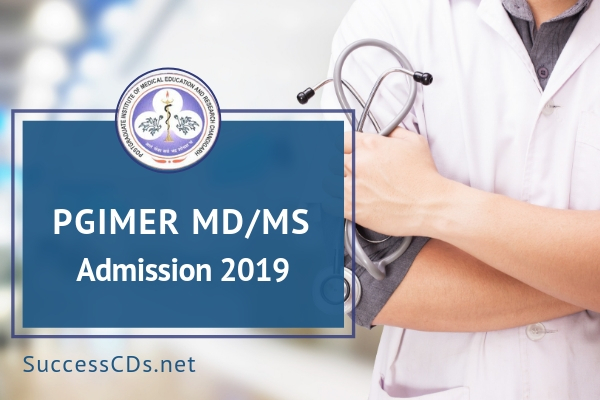 PGI Chandigarh Entrance Exam 2019 for PG Courses (MD, MS) - Postgraduate Institute of Medical Education & Research (PGIMER), Chandigarh has invited applications for admission to Doctor of Medicine (MD) and Master of Surgery (MS) Courses for the academic session starting from 01st July 2019 through PGI Chandigarh MD, MS Entrance Examination. Post Graduate Institute of Medical Education & Research is conducting PGIMER Entrance Exam 2019 for July session admission. Check here all the important information about PGI Chandigarh Entrance Exam 2019 for PG Courses (MD, MS) like Eligibility Criteria, Important Dates, Application Fee, Exam Pattern and Admit Card etc. read the notification below carefully. PGIMER Chandigarh conducts PGIMER Entrance Exam for the purpose of admitting students to various Postgraduate Courses offered at the institute. The PGIMER Entrance Exam is held twice a year for admission to 20 Postgraduate Courses. For admissions to academic session 2019-20, the institute is conducting PGIMER 2019 in two sessions i.e. PGIMER July 2019 session and PGIMER July 2019 Session. At present, this translates to basic pay of Rs.56100/- in the pay matrix (Level-10) as per 7th CPC plus other allowances as applicable. First Year Junior Resident (for MD/MS Courses) July 2019 - Anaesthesia; Biochemistry; Community Medicine; Dermatology; ENT; Forensic Medicine; Internal Medicine; Medical Microbiology; Nuclear Medicine; Obst. & Gynae; Ophthalmology; Ortho Surgery; Pathology; Paediatrics; Pharmacology; Psychiatry; Radiodiagnosis; Radiotherapy; General Surgery and Transfusion Medicine. Candidates must have passed MBBS, or its equivalent qualification, from a University/Institute recognized by the Medical Council of India (MCI). Candidates must have either completed, or due to complete, one-year rotatory internship training on or before 31st December/30th June & July session respectively (as per Annexure-1). Candidates must be registered with Central/State Medical Registration Council. Candidates will considered for selection to MD/MS courses based on a theory paper consisting of 250 multiple-choice questions (MCQs) with five alternatives each and single/multiple correct responses Negative marks will be given for incorrect responses marked. Duration of this competitive entrance exam, to the conducted at various centres at Chandigarh is three hours. The approximate number of questions for each subject is as follows: Applied Anatomy-06, Applied Biochemistry-12, Immunogenetics and Molecular Biology-10, Applied Physiology-06, Pathology-15, Pharmacology-12, Microbiology-12, Forensic Medicine-06, Social and Preventive Medicine-07, Internal Medicine-36, Paediatrics-12, Dermatology-06, Psychiatry-06, Radiodiagnosis-06, Obstetrics and Gynaecology-20, Dermatology-06, Radiotherapy-06, General Surgery-36, Otorhinolaryngology-10, Ophthalmology-10 and Orthopaedics-10. The questions paper has 250 questions, each with five response options. Hence there are a total 250 response options. One or more these five options can be correct for each question. The admission to the above courses of the institute is made on merit on all India basis, by holding an entrance exam by the institute, after issuing a countrywide admission notice. There will not be any clinical or practical examination. Allocation of various disciplines of MD/MS courses will be done on the basis of a personal counselling, strictly in order of merit in the respective merits lists of the theory examination. The number of candidates to be called for 1st counseling will be three times the total number of seats to be filled for each category of candidates, provided the candidates fulfill the cut-off points mentioned above. The selection will be finalized only after the counseling of the candidates. Any candidate who is absent at the time of counseling will not be considered for admission. All candidates are directed to deposit the above fees in any State Bank of India Branch by filling the challan form in the name of Director, PGIMER, Chandigarh (Exam) in the Power Jyoti Account No. 32211613319. Those candidates who have SBI account can also pay their fees through i-collect service No. 32222954695. Dates for submission of online applications and Generation of Challan forms/payment from i-collect is from 18th March 2019 to 18th April 2019. However, State Bank of India will accept the fees of those applicants whose challan form is generated on or before 18th April 2019 till 11:59 PM. PGIMER has released the schedule for PGIMER July 2019 entrance exam on its official Website www.pgimer.edu.in or https://pgimeradmissions.net.in/; the dates of the theory examinations, declaration of result and counselling for PGIMER 2018 admission are available on the official website of PGIMER. The admission prospectus for courses covered under PGIMER July 2019 session is at the official website www.pgimer.edu.in.